Kempinski Nile Hotel Cairo is a top luxury hotel set in the heart of the Cairo‘s Garden City, on the banks of the River Nile. This luxury Egypt hotel is a boutique property with 137 rooms and 54 suites where guests can delight in the views across the Nile as most of the rooms and suites have their own private balcony. Kempinski Nile Hotel offers its guests world hotel services coupled with state-of-the-art facilities within an engaging environment. The hotel also offers exceptional culinary experiences at the four restaurants and lounges located within the hotel. The hotel is just some kilometres away from Cairo International Airport, few minutes away from the Egyptian Museum, 15Km from Sakkara Pyramids, the Giza Pyramids and the Sphinx. 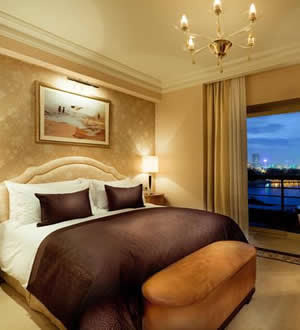 Kempinski Nile Hotel offers luxurious rooms with balconies. Each air-conditioned room is spacious and includes a work desk, satellite TV and minibar. The private bathrooms come with a bathtub and hairdryer, and some rooms have a seating area. 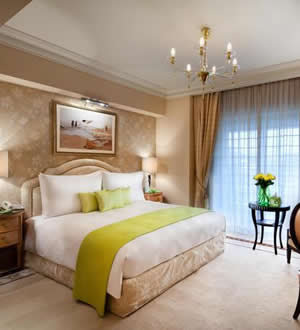 Cozy and comfortable rooms with generous bathroom and marble furnishings, offering breathtaking views of the city. 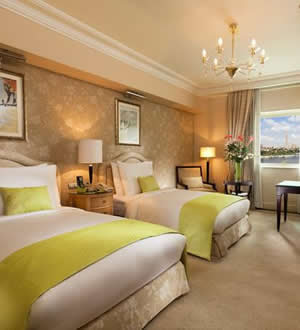 The rooms offer generous space for work or relaxation, with balcony for breathtaking views of the Nile or Garden city.